ISL Wind use a completely unique approach to maintaining Wind Turbines. All of our technology and equipment is custom made specifically for what we do. Our Wind Turbine Service Platform is patented to ensure that our service is like no other. The ISL Platform (ISL1) enables us to visually inspect blades and supply video and still images. At the same time we clean and polish the blades with Simple Green Environmentally Friendly Products in a quick and perfectly safe manner. A planned maintenance schedule to include cleaning, polishing, video scanning, blade testing and blade repair will help prolong the life of your blades. ISL Wind has been set up to maintain wind turbine blades in a professional manner using the latest innovative technology and implementing the safest possible access methods. Click on the numbers in the diagram to expand the text on the right! The servicing platform is lifted up to the wind turbine blade with the use of a Wumag WT700 access platform. With the use of this type of machinery, minute movements can be made to the positioning of the servicing platform thus allowing the operator to optimise the cleaning position for safe, controlled and efficient cleaning and polishing of the blade. This is ISL winds ’ Wumag WT700 lifting platform, as can be seen is mounted onto a 35t chassis. The two rear axles are driven axles whereas the front two axles are both steering axles this allows the vehicle to manoeuvre very well onto and around wind turbine farms. The Wumag WT700 has variable leg positioning, so any fluctuations in ground levels can be catered for whilst securing and levelling the machine. The primary controls for the Wumag WT700 are located within the service platform this allows the operator to move the access platform whilst in the air therefore eliminating any the errors that can be caused through machinery controlled from the ground. 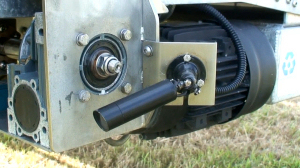 For added safety secondary controls are located on the truck chassis. There is no need for us to be supplied with an external power source. The power supply is provided via the onboard 400v 3 phase and neutral hydraulic generator. The hydraulic system that drives the access platform is also used to drive the generator. The turning on and off of the hydraulic generator is controlled from the primary controls within the service platform and the secondary controls on the truck’s chassis. Water tanks are mounted onto the access platform’s truck chassis; these tanks will hold 1400 litres of water, the water from the tanks is routed to a heating unit, also mounted on the chassis. The heating unit consists of a heater to heat the water to 40 Degrees Celsius; this is the optimal temperature for cleaning and for eliminating unwanted dirt. The heater is fuelled from the access platform’s diesel fuel tank. At this point an environmentally friendly cleaning solution is added to the water using a mixing pump. The heated cleaning liquid at the service platform is routed to washing jets mounted beside the brushes via a pressure reducing valve (The pressure reducing valve helps to reduce water usage). The turning on and off of the heater and pump for the cleaning liquid is controlled from the control panel in the service platform. A tank is mounted beneath the service platform; all unused cleaning liquid is routed from the brush cowlings into this tank. Within this tank the unused cleaning liquid is filtered and re-introduced into the cleaning liquid supply pipe. This system is designed to recycle and save water and cleaning solution. We have calculated that about 90% of the cleaning liquid is recycled. The service platform control panel is similar in design to the access platform’s control panel. The service platform control panel controls brush movements and also starts and stops other items including the heating unit and brush motors. From this control panel the service platform can be switched to automatic mode allowing lasers to control the brush movements for optimal washing and polishing of the wind turbine blade. All aspects are controlled through the PLC, which is the brain of the machine; this is mounted on the service platform and is powered by the onboard hydraulic generator. All power to parts of the service platform is fed from the PLC. All sensors mounted onto the service platform supply the PLC with information including the location of all moving parts. The PLC also uses information supplied by the service platform’s control panel. The PLC automatically controls all of the service platform’s movements when in the automatic mode. An aluminium shaft is the centre of the brush construction. The brushes are designed with durability in mind and have silica sand imbedded into the cleaning surfaces; these brushes are mounted onto the aluminium shafts in 100mm sections. 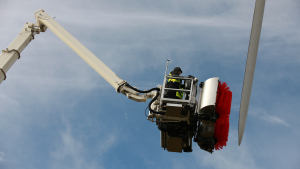 The brush diameter is 1 metre this allows maximum contact on the wind turbine blade whilst at the same time keeping the service platform at a safe distance. These brushes are similar to the brushes used for cleaning stubborn dirt, although the brushes are abrasive enough to remove the dirt they do not damage a wind turbine blade. The brushes are mounted onto telescopic rams. Using telescopic rams makes sure that the brushes remain in contact across all contours of the wind turbine blade whilst the brushes are moving. The telescopic rams are also employed to extend so the leading edge of the wind turbine blade can get a good thorough washing. Cowlings are fixed around half of the brushes, they have a dual role, firstly they protect the operator from any cleaning liquid from the spray from both the washing jets and the spinning brushes. Secondly, they capture any unused water; this is then pumped to the onboard recycling tank fitted beneath the service platform. Two actuators are fitted horizontally across the service platform; this is to allow both brushes to move from end to end of the service platform so making full coverage of the wind turbine blade possible. Fitted on these two horizontal actuators are another two actuators both fitted in the vertical plain, one for each brush mounting via the telescopic rams. These actuators allow each independent brush to move up and down the front of the service platform. With the combination of both the horizontal (x) and vertical (y) actuators full coverage of the front of the service platform can be achieved (full x-y movement). Another actuator is utilise to swing each brush from the horizontal position to the vertical position and vice versa. Laser Proximity Sensors are fitted above and below each brush, the information from these proximity sensors is fed into the PLC; from this information provided the PLC controls the brush in and out movement via the telescopic rams. Whilst the brushes are moving from side to side, the proximity sensors are used to make the brushes follow the contour of the blade, the proximity sensors are used for optimising the washing position of both brushes. 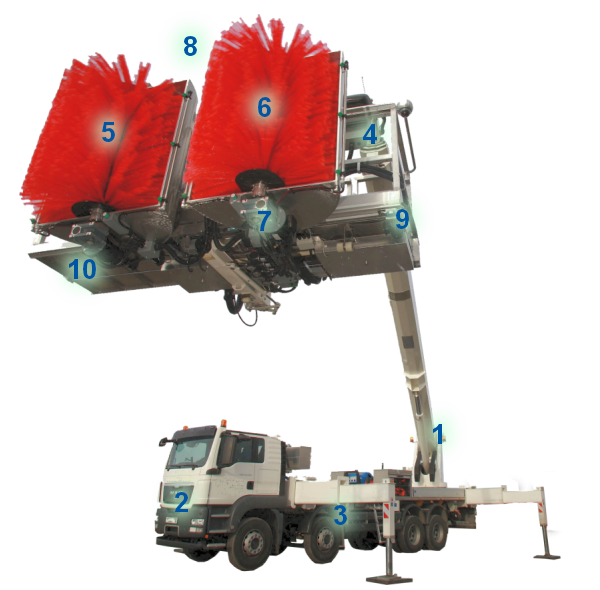 The washing jets are mounted either side of each brush, the washing jets spray cleaning liquid onto the brushes rather than the wind turbine blade; therefore saving the cleaning liquid by not produced any unnecessary spray into the environment. The optimal jet pressure is set via the pressure reducing valve to control water usage. Lights are fitted to the front of the service platform; these produce enough light for any low light environment. The lights fitted are of low energy design to conserve power. Cameras are fitted to the front of the service platform; these are built into the same module as the lights. The cameras are connected to a computer mounted onto the service platform next to the PLC. The images from the cameras are recorded onto the computer. A screen is connected to this computer, this screen is waterproof. 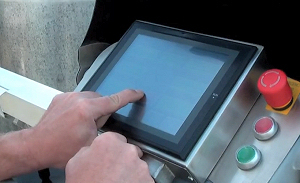 From the screen fitted to the service platform, images can be played back and reviewed and at the touch of a button on the waterproof keyboard, the image can be emailed to the offsite client for review. The service platform has a section that with the use of a telescopic hydraulic cylinder can extend from its closed position. 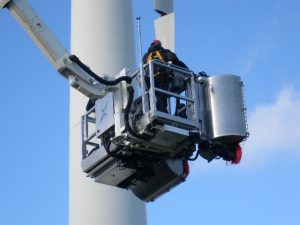 During the washing and polishing cycle the telescopic section of the service platform is in the closed position but if further inspection of the wind turbine blade is required the telescopic section of the service platform can be extended. With this telescopic section extended the service platform can be moved closer to the wind turbine blade for more detailed inspection including testing and repair. When the telescopic section of the service platform is extended the camera/light modules move across at the same time, this allows any close inspections to be videoed or still images taken of any problem. Once onsite the access platform is situated in front of the wind turbine required to be serviced, the access platform is then secured and levelled. The access platform is then extended from the closed position and the wind turbine service platform is positioned in front of the wind turbine blade. With the wind turbine service platform in position its controls are switched to automatic, at this stage the brush located in front of the access platform’s controls moves downwards, this is so that the access platform control operative can get a full view of the wind turbine blade. 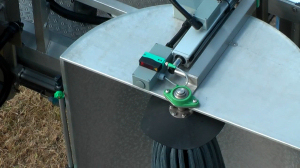 The washing jets and brush motors are turned on, the brushes automatically move from side to side whilst constantly keeping the brushes in the optimal position in relation to the wind turbine blade. Once the brushes have finished their automatic cycle the access platform is moved to the next starting position and the brushes repeat the same procedure. These steps are followed until the whole blade has been washed. At any stage the washing and polishing process can be stopped for review of any potential damage areas on the wind turbine blade. During the washing and polishing process; video images are being stored onto the computer mounted on the service platform; these images are constantly being reviewed. Once both sides of the blade have been washed and polished the above procedure is repeated for the next two blades of the Wind Turbine.